One Day in the Season of Rain (Penguin Modern Classics, 2015). Collaborative scholarly translation of Mohan Rakesh’s modernist Hindi play, Ashadh ka ek din, with Introduction, Notes, and other editorial material. “Modern Indian Theatre.” In The Routledge Handbook of Asian Theatre, ed. Siyuan Liu (2015). “Modernism, ‘Tradition,’ and History in the Postcolony: Vijay Tendulkar’s Ghashiram kotwal (1972).” Theatre Journal 65 (special issue on “Modernism,” December 2013). Honorable Mention for the Oscar G. Brockett Essay Prize, American Society for Theatre Research (2014). Theatres of Independence: Drama, Theory, and Urban Performance in India Since 1947 (University of Iowa Press and Oxford University Press, 2005). Winner, Joe A. Callaway Prize for the Best Book in Drama or Theatre published in 2004-2005 (2006). Finalist, George Freedley Memorial Award, Theatre Library Association (2006). “India’s Theatrical Modernity: Re-Theorizing Colonial, Postcolonial, and Diasporic Formations.” Theatre Journal 63 (2011). “Representing India’s Pasts: Time, Culture, and the Problems of Performance Historiography.” In Representing the Past: Essays in Performance Historiography, ed. Thomas Postlewait and Charlotte Canning. University of Iowa Press (2010). “Criticism, Critique, and Translation.” Seminar 588 (2008). “Mohan Rakesh, Modernism, and the Postcolonial Present.” South Central Review 25.1 (2008). Introductions to The Collected Plays of Girish Karnad, 2 vols. Oxford University Press (2005). “Diaspora and the Theatre of the Nation.” Theatre Research International 28.3 (2003). “Diaspora, Nation, and the Failure of Home: Two Contemporary Indian Plays.” Theatre Journal 50.1 (1998). “Language, Identity, and Nation in Postcolonial Indian-English Literature.” (with Vinay Dharwadker). In English Postcoloniality: Literatures from Around the World. Ed. Gita Rajan and Radhika Mohanram. Greenwood Press (1996). “Historical Fictions and Postcolonial Representation: Reading Girish Karnad’s Tughlaq.” PMLA 110.1 (1995). “John Gay, Bertolt Brecht, and Postcolonial Antinationalisms.” Modern Drama 38.1 (1995). “Performance, Meaning, and the Materials of Contemporary Indian Theatre: An Interview with Girish Karnad.” New Theatre Quarterly 44 (1995). Cosmo-Modernism and the Other Theatre. A study of modernist dram and theatre in India, 1950-1990. A Poetics of Modernity: Indian Theatre Theory, 1850 to the Present. Edited collection of seminal works of theatre theory and critcism (in English, and in English translation from twelve languages) by Indian practitioners, 1850-present. Selections from books, essays, lectures, letters, manifestoes, and memoirs by playwrights, directors, actors, designers, activists, and policy-makers. Professor Dharwadker has held fellowships from the NEH, the American Institute of Indian Studies, the International Research Institute, Freie Universität (Berlin), the Newberry Library, and the Folger Library, among others. From 2007-12 she also held the H.I. Romnes Fellowship at the University of Wisconsin-Madison for oustanding scholarship in the Humanities. She has served on the editorial board of Genre, the Fulbright Screening Committee for India, the Gerald Kahan Prize Committee of the American Society for Theatre Research, and the 2013 ASTR Program Committee. Professor Dharwadker has lectured widely at institutions in North America, Europe, and India, including Harvard University, Yale University, University of Toronto, Rutgers University, University of Pennsylvania, University of Chicago, Freie Universität, and Delhi University. 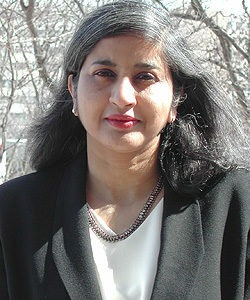 Aparna Dharwadker. Theatres of Independence: Drama, Theory, and Urban Performance in India Since 1947. Oxford University Press & University of Iowa Press, 2005. 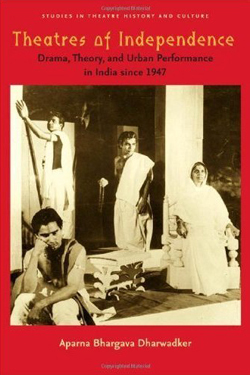 Theatres of Independence is a comprehensive study of drama, theatre, and urban performance in post-independence India. Combining theatre history with theoretical analysis and literary interpretation, Aparna Dharwadker examines the unprecedented conditions for writing and performance that the experience of new nationhood created in a dozen major Indian languages. The book also offers detailed discussions of the major plays, playwrights, directors, dramatic genres, and theories of drama that have made the contemporary Indian stage a vital part of postcolonial and world theatre. Theatres of Independence will be of interest to students and scholars of modern drama, comparative theatre, theatre history, and the new national and postcolonial literatures.